The new line of ANKARA 3 and LIMA 3 dual basin islands ensures excellent performance and high energy saving. The lines elegance and essential style allow the best visibility of the products on display, obtaining advantageous values as regards both loading capacity and display surface. Innovative product for users with space problems, expresses the perfect balance between use of floor space and display area. The product of a careful study of volumes and shapes, offers the perfect combinations of handsome design and efficient function, ensuring a high turnover of the products displayed. Daytona combines the typical features of wall cabinets and islands, creating a new type of unit that allows you to display products in both the upper basin, as found in an island, and also on vertical display shelves, like wall cabinets have. Daytona therefore offers a much greater potential load capacity with the same footprint. The semi-vertical Mini Arka permit large quantities of product to be loaded in the basin, creating a bulking-out effect similar to classic horizontal basins. Two mesh shelves further increase display. This all reduces staff intervention and helps optimise management costs. The slow-closing doors ensure customer comfort, while large glass panels in the design ensure excellent lighting and visibility. It is possible to multiplex the units back-to-back and add a front-on unit. Going to the discovery of Arnegs stands, many are the customers and visitors who find out with great excitement the technological heart of the Sharing Avenue: the Compressor Racks and the new cooling technologies such as the innovative ARNEG CO2 Water Loop System. What is it? An advanced cooling system that join in one single solution three technologies: the water loop, the variable speed compressor which adapts the cooling capacity on the base of the working conditions optimizing the energy saving and, finally, the CO2 used as refrigerant, the only one not flammable, non-toxic, non-explosive, with the lowest value of greenhouse effect. Many and very important are the advantages: each cabinet has its own compressor, the system is simple to be installed it does not require skilled personnel for the installation and management, without any charge limit and is suitable to be used for heat recovery. Moreover it is a long-term solution referring to the limitations stated by the F-Gas Regulation. We moved from the cold to the evolution of purchasing behaviors, between heart and brain, told with great emotional participation by Luigi Rubinelli, RetailWatch.it director, who invites to focus on the real needs of customers who are primarily all men and women with specific needs and priorities. Watch the video: DAY 2: ARNEG AND ORGANIC, AN ENERGIZING COMBINATION! Inebriating. This is the word that best describes this second day of Euroshop that for Arneg stand opens with a real sea of people. From the first hours of the day many customers and visitors turned out along the Sharing Avenue to explore the endless opportunities offered in all directions by this walkable space, in the sign of sharing. The wine shop space, is the angle of the sharing par excellence, the place where you can taste the precious nectar that loosens the tongue, feeds the conversation and evokes the best Made in Italy. As what Arneg expresses in its innovative design solutions dedicated to these spaces studied for cheers that seal agreements, give rise to new collaborations and that tell business philosophies. A space that is home to the best Italian wine productions to which Arneg wanted to link his name by creating a customized collection inspired by the key concepts of its style of doing business: Sognare (Dreaming), Buon Senso (Good Sense), Coraggio (Courage) and Fantasia (Fantasy). And it is precisely to the Italian excellences and the new formats of Italian cuisine that is dedicated the speech of the gastronome Davide Paolini: this second event of the Future Store Forum enhanced the quality of typical Italian products and the professionalism of producers, to be given value with seriousness and commitment. Watch the video: IT'S JUST THE BEGINNING! Once again, the Arneg Group — a leading name in the design, production and installation of equipment for the retail sector — takes the field with a strong message announcing an important step forward in the development of innovative synergies and partnerships of excellence. EUROSHOP IN DÜSSELDORF is the most important trade exhibition dedicated to the world of retail at global level. With 120,000 m2 of floor space at its disposal, today the show welcomes 2,500 exhibitors from 60 countries and a huge number of visitors, offering a rich mix of meetings, seminars and workshops through which to present all the facets of an endlessly evolving sector. Euroshop affords a particularly stimulating arena for the ARNEG GROUP. With production sites and branches established in 25 countries, Arneg enjoys a high profile on the world market precisely by virtue of maximizing synergies between companies of the group and fostering a constant flow of ideas and information vital for its growth, and for market success. Sharing to grow and growing to share. This is the spirit in which ARNEG WORLD takes on global challenges — a spirit of intelligent growth. A regular at EUROSHOP since the 1970s, the ARNEG GROUP brings something new to every edition, always varying the message, but keeping faith with a multi-disciplinary approach (technological, philosophical, architectural, ethical and environmental). For EUROSHOP 2017, ARNEG GROUP plays on multiple levels, joining pathways, bringing together people, products and technologies, utilizing the interaction of different communication tools to tell inspirational stories of networking, goal-sharing and collective intelligence. 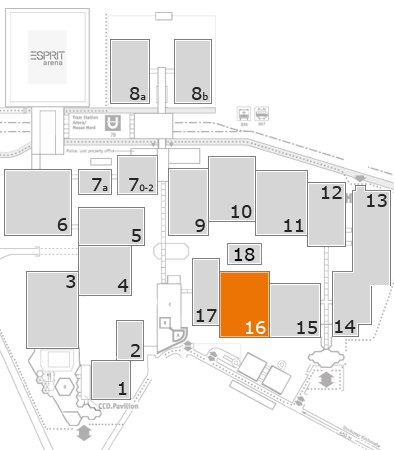 The ARNEG GROUP will be exhibiting from a stand with numerous top level features, which this year occupies a space of almost 3,000 m2. The new ARNEG GROUP stand is created as a SHARED SPACE, accessible in all directions and from all angles, wired throughout. A space organized as three interconnected areas — TECHNOLOGY, MERCHANDISE, TASTING — offering an experience of the extraordinarily complex and no less fascinating world of relations that underlies each product, each solution and each successive step in the growth of the ARNEG GROUP. In this new digital and internet age, the ARNEG GROUP engages the world of retailers as a one-stop partner offering innovative and sustainable solutions and proposals, designed to assist customers in achieving the aim of “zero emissions”. The approach to products is interactive, dynamic and shared, thanks to the adoption of LED WALLS, INFOGRAPHICS and INTERACTIVE POINTS allowing users to discover a multitude of factors having a part to play behind each product. In the spirit of sharing, besides updating the numerous social channels on which it is constantly active, the ARNEG GROUP has now also set up a TOTALLY RESPONSIVE WEB PORTAL dedicated entirely to the exhibition — https://euroshop.arneg.world — where users will be able to find all the most interesting information on the Arneg stand. News, events, organization, guide to the products on show, hospitality management and much more... all easily consulted by guests in their own personal area, thanks to a technology that makes life simple, and at the same time brings the gratification of being totally involved.